Top 5 Cydia Alternatives for iOS 12 – Hello everyone, Today I am going to tell you about the 5 amazing Cydia alternatives that you can download for free on your iOS 12 devices. guys, these Cydia alternatives are the best for iOS 12. you can download them on the iOS 11 or 10 too. also, you don’t need to jailbreak your iOS devices to download these awesome third-party app stores. so now let’s go further and have a look at these app stores. CokernutX it’s pretty awesome. this Cydia alternative has a ton of apps and games to offer. so it has the featured section on the home screen of the app and then you will have there different tabs to go. so on the second tab, you will have a section for the game. so if you go right there then you’ll see a bunch of games that you can get on your device and then you will have also the apps section right there. So right there on the app, you won’t see as many apps and games but as I said this Cydia alternative has a lot to offer. just go ahead and go to the search bar and even if you don’t see favorite app or game within the app then you can go ahead and search them right there and there are a ton of apps and games to download from CokernutX. Next up we have top stores. this Cydia alternative has also been released recently and it’s pretty awesome as well a very nice and simple UI. So, on the home screen of the app, you’ll find a ton of tweak games and apps to download right there from the home screen and then you will have different sections. of course, you will have the apps right there and you can find tweaked apps, movies apps, and all that cool stuff. You will have paid and other apps right there and then also you will have the section for the game and you have a bunch of tweak games right there and also you will have a search bar there to search for any app that you want to. downloading an app it’s pretty simple, just go ahead tap get and you should be able to install that app. So you will see the details about the app just go ahead and tap get and wait for the app to install. It’s as easy as that, getting these apps from the top store is pretty cool and very simple and easy to use Cydia alternative for unjailbroken devices. Next up is ignition, ignition is very popular and it’s easily one of the best alternatives that you can get on your unjailbroken iOS 12 device. On the homescreen, you will have different sections. so you will have all apps then you will have the app store, emulators, entertainment, games, social, tweaked all that cool stuff. So you will have different categories of apps and it’s way easier to find the app that you want. If you want ++apps then go ahead open the tweak section and then you can find all the ++apps right there. if you want to get one of them then all you have to do is just go ahead and tap on whichever you want to get and just tap get right there. it’s as easy as that getting these apps from use ignition. So ignition is one of the best Cydia alternatives that you can get on your iOS 12 device. also, they are going adless. so for a few months, they will remove the ads. so you won’t see any ads on apps side by ignition. so that’s really amazing as well. The next one is panda helper and this one has been around for a while. now but I really like it, because it has a ton to offer a lot of Cydia alternative, don’t have a lot of apps or games on them panda helper has a ton of them. On the home screen of the app, you will have the search bar at the top and then you will have featured games and apps. It’s a bunch of tweak games and also tweaked apps as well. If you go to the games section then you will find also different categories. you will have the latest uploads then you will have tweak games and then you will have also paid games right there. the other section right there is apps and you will have there the latest apps, you will have the tweaked apps and all the ++apps and then you will have paid, media, social, and also utilities. To download one of them to your device. it’s fairly simple, just go ahead and open the app you will see details about the app there. just go ahead click install and then it shows the pop-up, which allows you to install the app on your iOS 12 device. Last but not least is AppValley, AppValley is very famous know most of you guys already know about it. so on the home screen of the app, you will have featured. So you will have there featured apps and games and then you will have the tweaked, ++apps and lower you will have recommendations for this tweak and then also you will have the jailbreak apps right there. You will have stream live TV, movies on iOS all that cool stuff then you will have also the different section, you will find the games and apps right there and then you can find there all the newest updates of AppValley. So that is it for this article guys. 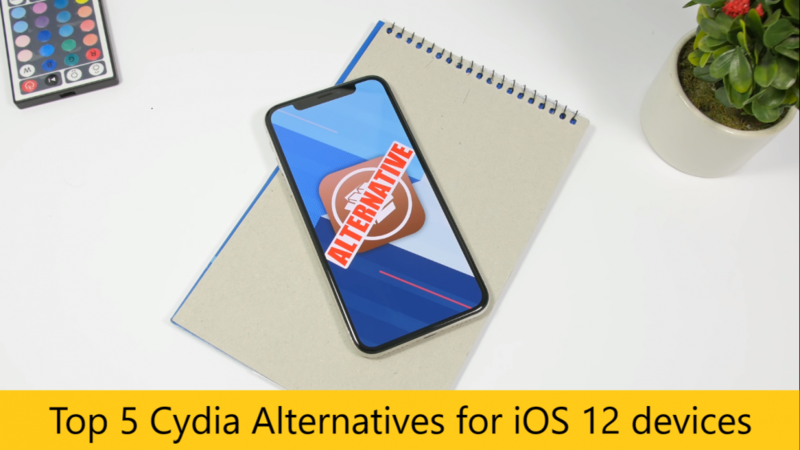 these are the best Cydia alternatives for iOS 12 devices, from where you can download tweaked apps and games for your unjailbroken device. that’s it thank you guys for reading, don’t forget to share and also visit daily on this website for more.